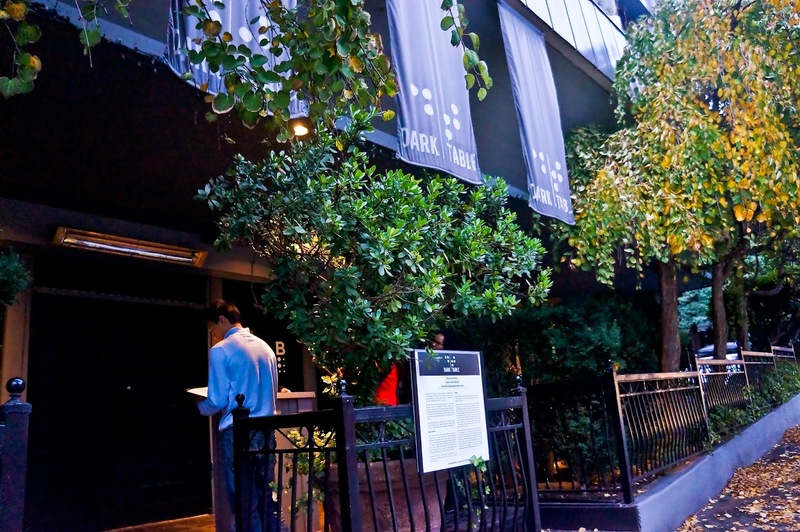 So, It was our anniversary and I really wanted to return to Dark Table for old time's sake - it was where we had our first date ! I remember quite clearly that he asked if he could take me out for dinner, and after some flirty and playful dialogues, I said yes. I remember we were both single and socially busy back then, so he asked me on a Wednesday, but we had to arrange the date to, not the coming, but the next Thursday. To be honest, I was happy but wasn't overly nervous or excited when he first asked me. Nevertheless, a lot could change between two brand new mutually attracted souls in 9 days. My feelings for him progressed in a magical speed, and by that Thursday, I was SO nervous. I literally prayed that we wouldn't kill it. I remember he said to me the same thing, reason being, "I don't think I would have been this nervous if we don't have some sort of chemistry" Ohhh... he was such a flirt. And I was like, "who says there's chemistry?" Ooooooooooohhhhhh man, I miss flirting and that smiling like an idiot phase. It definitely is a privilege single people should practice religiously and not take for granted. Tada ! This might as well be my first OOTD of the blog that deserves a new category. So this is my First Date OOTD. I forgot what shoes I wore, or if I wore heels or flats. But I remember pairing this outfit with a white Chanel purse and a brown coat. These two photos are not from the actual first date. But because I'm the cheesiest person in the world, I've decided to dress exactly the same on our Anniversary. Since I put so much effort into picking out the clothes two years ago, I still remember exactly what I wore. On a first date, you need to NOT be overly dressy (as though you care that much) but definitely dress well (because you do care that much). Go for something a tiny bit above casual, since it's usually at a finer restaurant. Something with good quality, something that accents you well. I went for a very smooth and flowy silk blouse that has a gentle and romantic look to it. It's see-through so I wore a white tank underneath. Then it becomes transparent but you can't see anything. Conservative seduction, hahaha. I paired this top with a brighter color high waisted skirt. 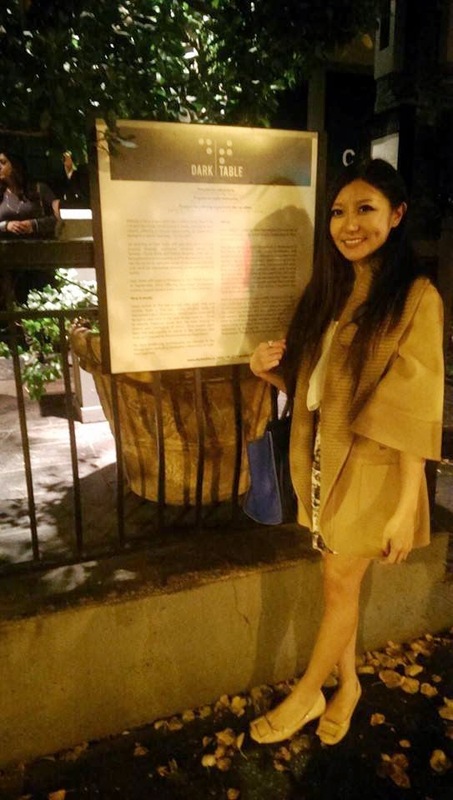 Not a mini skirt, never on a first date, but short enough to show the pretty long legs. Oh, and these are my Fall Color Nails that day. A little more on our first date before I move on to the Anniversary dinner and Dark Table, because writing about it is just so fun. So on the day of, I got off at 6pm from work. Tokyo Drift style back from Downtown to Richmond, freshened up, and waited anxiously. He arrived on time (which rarely happens now). Dark Table was very new back then, there weren't as many people as there are today. We followed our waitress to our seats and got seated safely. He was going to pick the restaurant, but I suggested Dark Table when I saw my friend went. I'm so glad this is our first date spot instead of those conventional romantic western food places. Literally, a blind date. We both found the idea of dining in pitch dark fun and exciting. Right after we were seated, he reached out his hand to my direction and brushed across mine accidentally. He said he was trying to gauge the distance between us, and the size of the table. Imagine the butterflies ! We had a very pleasant dinner that day, talking and laughing through out. I remember we both picked the surprise dish, and they turned out to be chicken. They weren't bad, but weren't crazy good. At that time we thought, Dark Table won in experience, not food quality. But two years after, we went back there for our Anniversary, and the food was great ! 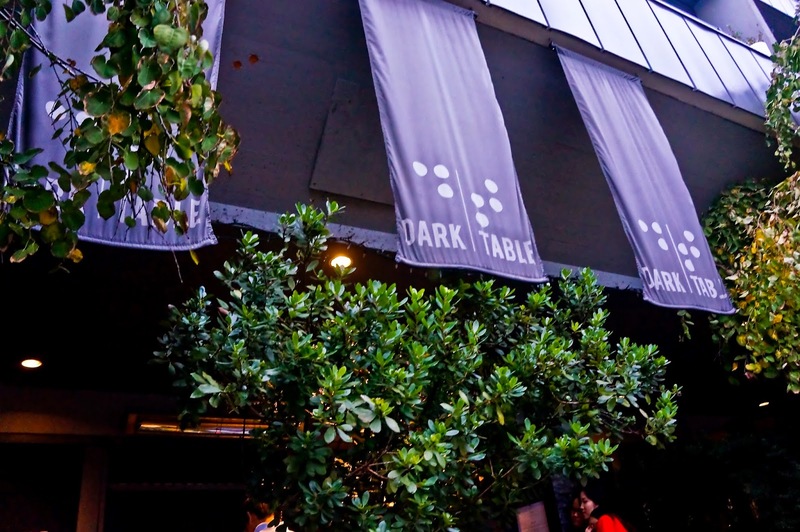 Our Anniversary landed on a Friday this year, and Dark Table was so packed ! As for reservations, we could only choose from either 6 pm or 8:45 pm , so we went with the earlier slot, but the restaurant was already incredibly busy. After you arrive at the entrance, a staff will hand you a menu and take your order (because you won't be able to see the menu inside). We went with the 3 course meal, and for our main courses, I ordered the Garlic Prawns with Citrus Risotto, and Frank, the Beef Tenderlion. After a little wait, our server came to take us in. Do not come here if you have Nyctophobia. The walk from the entrance to our table was a little scary to me. 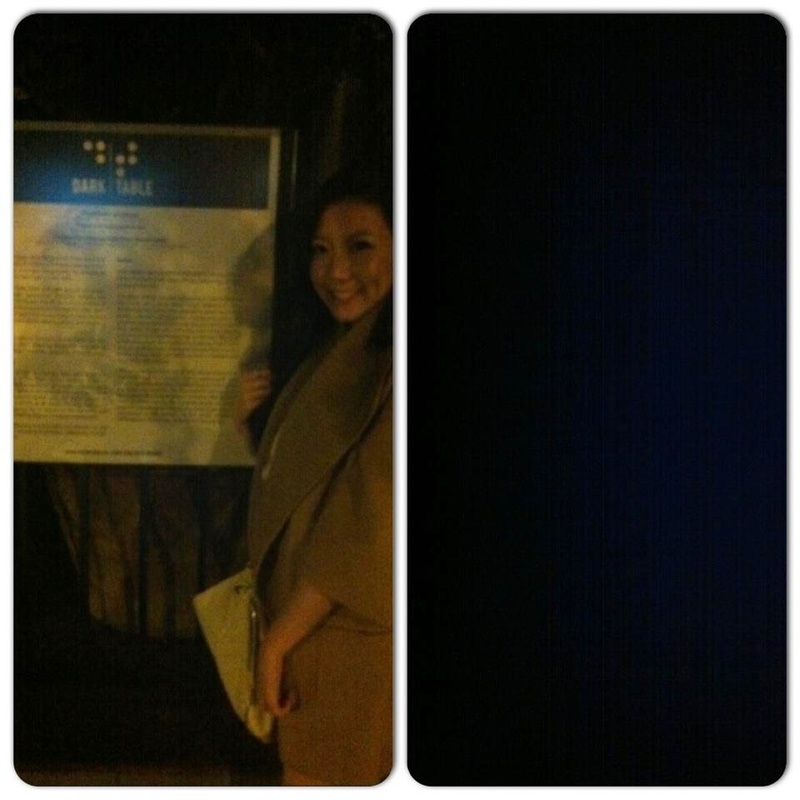 It was seriously completely completely dark. It was darker than the darkest night with all your curtains closed. 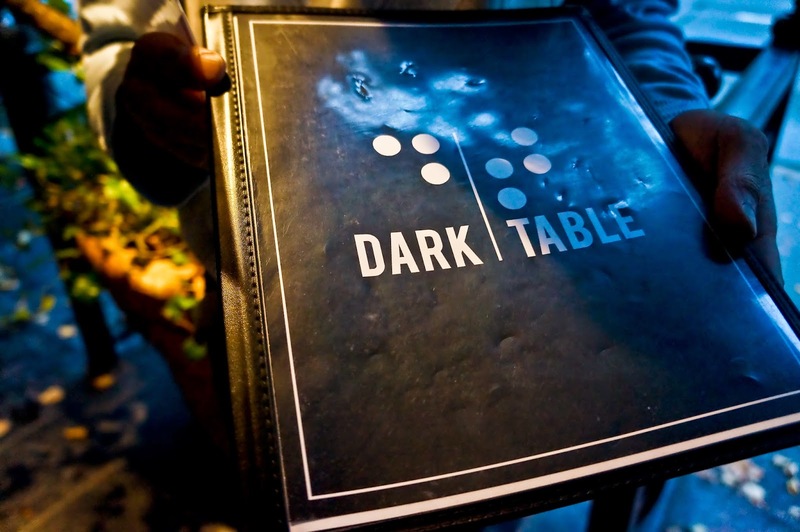 I actually have visited the Dark Table 3 times, but the darkness shocked me every single time. I had to completely trust the system. I had to trust that they won't make me trip over something, bump into something, or push me off a cliff. It was a really busy night, so Frank and I were arranged to be seated side by side (which I actually prefer), instead of sitting across like last time. We couldn't see, of course, but to our suspicion, we guessed that we were sharing a round table with one other couple sitting across because their voices seemed really close to us. I reached out my arms to feel around, I felt other table corners and chairs, which meant the restaurant was actually really crowded that day. The main dishes were delicious and it was a challenge for me to eat mine with a folk. I kept missing the food and put air in my mouth. This blind dining experience with him was so fun, especially this time, because we were comfortable enough to do so much more in the dark ! Like feeding each other our food, poking risottos on his face, and so on. Our desserts came last and mine was cheesecake, his was something we couldn't figure out but good too. I'm so glad Dark Table exists. It has brought me nothing but happy memories. 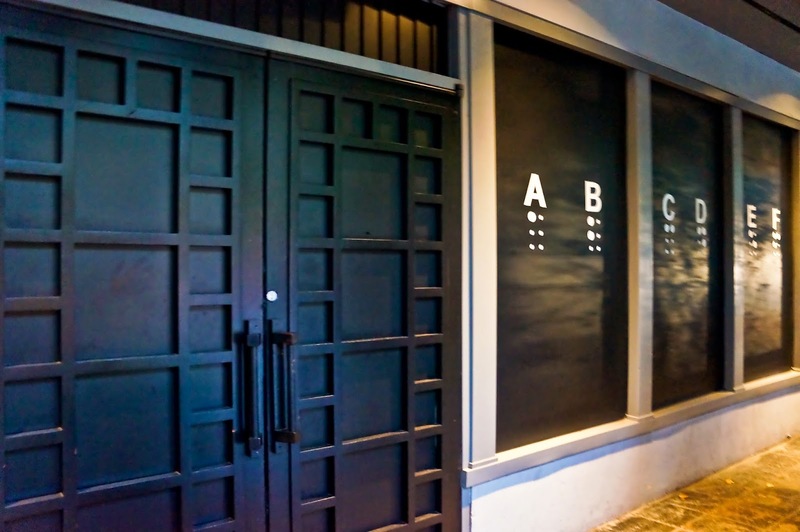 It's a great place for dates and if you are just looking for something to do in Vancouver that's out of the ordinary. I highly recommend it, especially now that the food has gotten so much better.